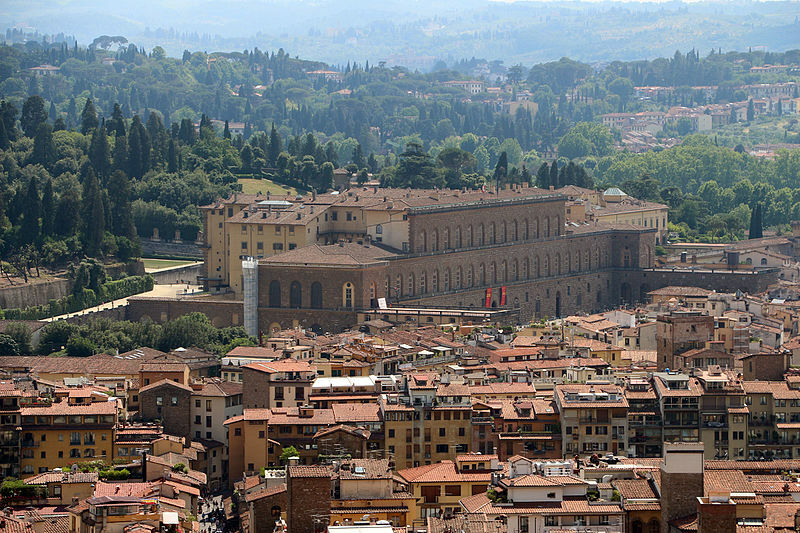 As the Medici consolidated their power in Florence, they made a point of confiscating or buying up the most important properties of their former rivals, especially their family palaces. The most spectacular example of this was the Grand Duchess Eleanor’s acquisition in 1549 of the Pitti Palace, built in 1457 by a banker named Luca Pitti, an influential part of the Medici machine who occasionally had vague ambitions of toppling the Medici and becoming the big boss himself. With its extensive grounds, now the Boboli Gardens, the palace was much more pleasant than the medieval Palazzo Vecchio, and at Eleanor’s insistence she and Cosimo I moved in there for good. The palace remained the residence of the Medici, and later the House of Lorraine, until 1868. The original building, probably designed by Brunelleschi, was only as wide as the seven central windows of the façade. Succeeding generations found it too small for their burgeoning hoards of bric-a-brac, and added several stages of symmetrical additions, resulting in a long bulky profile, resembling a rusticated Stalinist ministry. The very smart forecourt sloping from Via de’ Guicciardini to Piazza Pitti was completed for the European Summit in June 1996. Would the Medici have approved? In the 17th century, the gate of the Pitti was hung with wine bottles like many other Florentine palazzi, advertizing wine for sale in the cellars. flowed a torrent of bad taste that has not yet dried up . . . if there had been Toby jugs and Swiss weather clocks available, the Grand Dukes would certainly have collected them. The Pitti museum that most people see is the Galleria Palatina, containing the Grand Dukes’ famous collection of 16th–18th-century paintings, maintained as it originally looked, stacked on the walls in enormous gilt frames under the berserk opulence of frescoed ceilings celebrating planets, mythology and, of course, the Medici. The gallery occupies the first floor of the right half of the palace; the ticket office is on the ground floor, off Ammannati’s exaggerated rustic courtyard, a Mannerist masterpiece of colossal proportions. The size of it was determined by the Pitti, who, out of spite for the Strozzi family, made it large enough to swallow the entire Palazzo Strozzi. After the entrance to the Galleria is the neoclassical Sala Castagnoli, with the Tavola delle Muse in its centre, itself an excellent introduction to the Florentine ‘decorative arts’; the table, a paragon of the intricate art of pietra dura, was made in the 1870s. The Galleria’s best paintings are in the five former reception rooms off to the left, with colourful Baroque ceilings painted in the 1640s by Pietro da Cortona. The set route, however, takes you through the other part of the palace first, starting with the Sala di Prometeo containing Filippo Lippi’s lovely Tondo Bartolini and the Sienese Baldassare Peruzzi’s unusual Dance of Apollo. Next you can peek into the Sala di Bagni, the Empire bathroom of Elisa Baciocchi, Napoleon’s sister, who ruled the Département de l’Arno between 1809 and 1814, and seemingly spent much of those years redecorating the Pitti. Caravaggio’s Sleeping Cupid is the highlight in the Sala dell’Educazione di Giove. The next room to this is the pretty Salla della Stufa, frescoed with the Four Ages of the World by Pietro da Cortona. The first of the reception rooms, the Sala dell’Iliade (painted in the 19th century), has fine portraits by the Medici court painter and Rubens’ friend, Justus Sustermans. Two Assumptions of the Virgin by Andrea del Sarto, Philip II by Titian, La Maddalena by Artemisia Gentileschi and a Velázquez equestrian Portrait of Philip IV share the room with one of the most unexpected residents of the gallery, Queen Elizabeth I, who looks a bit uncomfortable in their company. In the Sala di Saturno Raphael dominates, with several paintings done in his early Florence days: the portraits of Maddalena and Agnolo Doni (1506) and the Madonna ‘del Granduca’, influenced by the paintings of Leonardo. 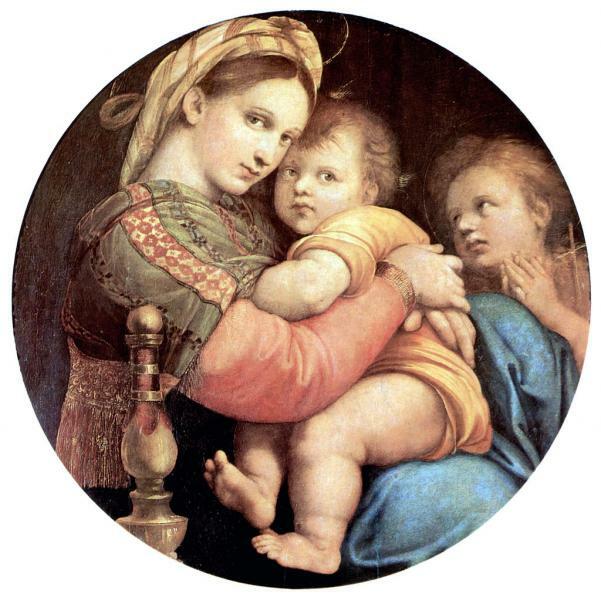 Ten years later, Raphael had found his own style, evident in his famous Madonna della Seggiola (‘of the chair’), one of the most popular works he ever painted, and one that is far more complex and subtle than it first appears. 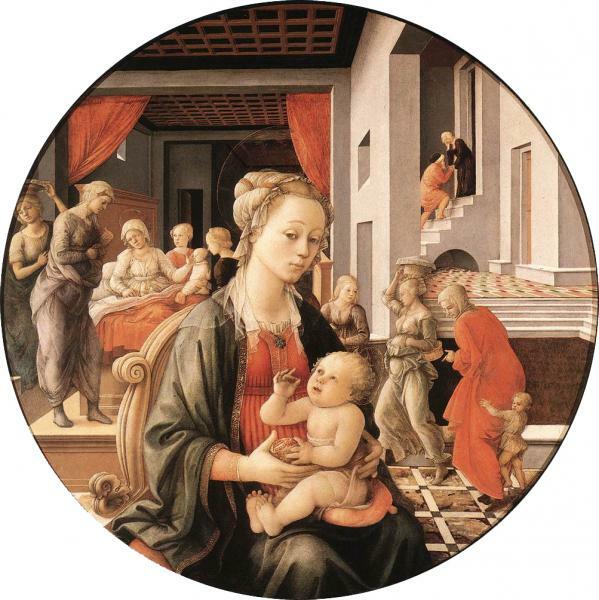 The rounded, intertwining figures of the Madonna and Child are seen as if through a slightly convex mirror, bulging out – one of the first examples of conscious illusionism in the Renaissance. The Sala di Giove, used as the Medici throne room, contains one of Raphael’s best-known portraits, the lovely and serene Donna Velata (1516). The small painting The Three Ages of Man is usually attributed to Giorgione. Salviati, Perugino, Fra Bartolommeo and Andrea del Sarto are also represented here. The Sala di Marte has two works by Rubens, The Four Philosophers and The Consequences of War, as well as some excellent portraits by Tintoretto and Van Dyck (Cardinal Bentivoglio), and Titian’s rather dashing Cardinal Ippolito de’ Medici in Hungarian costume. Although destined for the Church, Ippolito was one of the more high-spirited Medici, and helped to defend Vienna from the Turks before being poisoned at the age of 24. In the Sala di Apollo there’s more Titian – his Portrait of a Grey-eyed Noble Man who resembles the perfect 16th-century English gentleman, a romantic character with an intense gaze, and his more sensuous than penitent Mary Magdalene – as well as more by Andrea del Sarto and Van Dyck. The last reception room is the Sala di Venere, with works by Titian, including the famous Concert, a work perhaps partly painted by Giorgione and a powerful Portrait of Pietro Aretino, Titian’s close and caustic friend, who complained to the artist that it was all too accurate and gave it to Cosimo I. There are two beautiful, optimistic landscapes by Rubens, painted at the end of his life, and an uncanny self-portrait, entitled La Menzogna (the Falsehood), by Neapolitan Salvator Rosa. The centrepiece statue, the Venus Italica, was commissioned by Napoleon from neoclassical master Antonio Canova in 1812 to replace the Venus de’ Medici which he ‘centralized’ off to Paris – a rare case of the itchy-fingered emperor trying to pay for something he took. Paintings to ferret out include Filippino Lippi’s Death of Lucrezia and Raphael’s Madonna dell’Impannata, both in the adjacent Sala di Ulisse. Free guided tours of the court kitchens, little changed since the 16th century, and the ornate 17th-century King's Apartment, once the private chambers of Grand Prince Ferdinando, and later of the Lorraine Grand Dukes, and then of King Vittorio Emanuelle II, take place at 10.30am, 11.30am, 3.30pm and 4.30pm, departing from the Room of Castagnoli (near the entrance); only 15 people at a time allowed—there's a list for signing up. Beyond the Sala delle Nicchie are the State Apartments, situated in the right half of the Pitti. These were last redone in the 19th century by the Dukes of Lorraine, with touches by the Kings of Savoy, who occupied them during Florence’s brief interlude as national capital. Among the heavy, garish but expensive furnishings, there is a fine series of Gobelin tapestries ordered from Paris by Elisa Baciocchi. Florence keeps its works from the late 18th and 19th centuries on the second floor above the Galleria Palatina, a floor originally intended for children and servants. 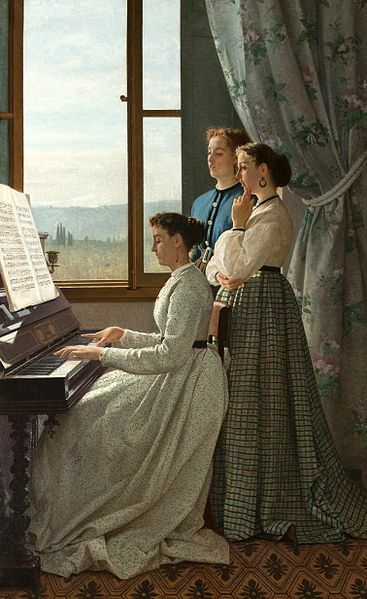 Though the monumental stair may leave you breathless (the latter Medici, if they ever had occasion to visit, negotiated it with sedan chairs and strong-shouldered servants), the sunny paintings of the Italy of your great-great grandparents have a sweet charm all their own. The gallery's 30 rooms are arranged in chronological order, starting with Neoclassical works and ending with works from the 1920s. What sets it apart are the canvases of the ‘Splatterers’ or Macchiaioli (Tuscan Impressionists), offering an excellent introduction to the works by Silvestro Lega (famous for his interiors) Giovanni Fattori (especially his Rotonda Palmieri and scenes of Tuscany's Maremma region), Nicolo Cannicci, Francesco Gioli, Federigo Zandomeneghi, and Telemaco Signorini, punctuated here and there by enormous Risorgimento battle scenes. Towards the end is a room dedicated to Michele Gordigiani, the portraitist of Italian aristocracy. What comes as a surprise, especially if you’ve been touring around Florence for a while, is that the marriage between painting and sculpture that characterizes most of its art history resulted in a nasty divorce in the late 1800s: while the canvases radiate light, the statues becomes disturbingly kitsch, morbidly, stupefyingly obsessed with death and beauty, culminating with The Pregnant Nun and The Suicide, by Antonio Ciseri. Same opening hours as Arte Moderna; The ground floor on the left flank of the Pitti was used as the Medici summer apartments and now contains a museum showing off the family’s incredible hoard of jewellery, vases, trinkets and pricey curiosities. The Grand Duke’s guests would be received in four of the most delightfully frescoed rooms in Florence, beginning with the Sala di Giovanni di San Giovanni, named after the artist who frescoed much of it in the 1630s. The theme is the usual Medici tooting their own horns – but here playing nostalgic golden oldies. 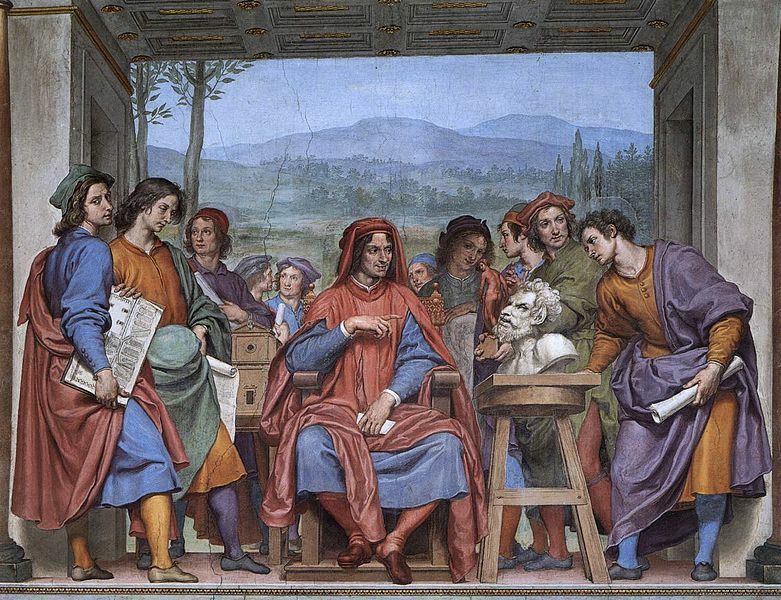 Here Apollo and the Muses, chased from Parnassus, find refuge with Lorenzo il Magnifico; a fresco by Francesco Furini shows him in the Platonic Academy at Careggi, and in a fresco by Ottavio Vannini, Lorenzo smiles as he studies a bust of a Faun presented by a young Michelangelo. His real passion, a collection of antique vases carved of semi-precious stones or crystal, is displayed in a room off to the left; the vases were dispersed with the rise of Savonarola, but Lorenzo’s nephew Cardinal Giulio had no trouble in relocating them, as Lorenzo had LAUR.MED. deeply incised into each. The three Reception Rooms were painted in shadowy blue trompe l’oeil by two masterly Bolognese illusionists, Agostino Michele and Angelo Colonna. The Grand Dukes’ treasure is up on the mezzanine. These golden toys are only a small fraction of what the generations of Medici had accumulated; despite the terms of Anna Maria’s will, leaving everything to Florence, the Lorraines sold off the most valuable pieces and jewels to finance Austria’s wars. Among the leftovers here, however, is an apoplexy of fantastical bric-a-brac: jewelled bugs, cameos, sea monster pendants, interlaced ivory cubes, carved cherry pits, gilt nautilus shells, chalices made of ostrich eggs, enough ceramic plates to serve an army, a Mexican bishop’s mitre made of feathers, intricate paper cut-outs, buffalo horn cups, and 17th-century busts and seashell figurines that would not shame the souvenir stand of any seaside resort. This, the only museum dedicated to the history of fashion in Italy, is housed in the Meridiana pavilion, the south extension of the Pitti, a lavish Neoclassical addition added by the Lorraines in 1776. 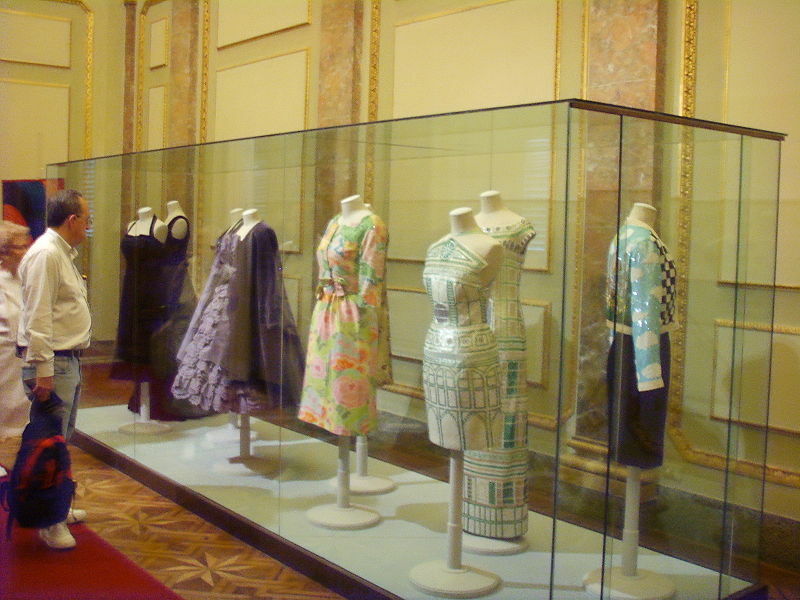 It houses over 6000 garments, although gowns from as lavish as any Grand-Ducal treasure, astonishing feats of stitching, bead and crystal work, lace and embroidery from the 16th-century reconstructed dress that Eleanor of Toledo was buried in – the same one that she wears in Bronzino’s famous portrait in the Uffizi—to the present, with pieces by Versace, Armani and co. In the 17th century, Cosimo III built the Casino del Cavaliere on the hill overlooking Boboli gardens. Since 1973, it has housed the grand ducal porcelain collections, with 2000 pieces, including objects made by Francesco de' Medici, who was obsessed with porcelain, and dinner plates used by the Medici, Lorraine and Savoy kings. If you're into porcelain, it's not to be missed, with settings from the royal works in Naples, Carlo Ginori of Florence, Vincennes, Vienna and Meissen; there's also the Sèvres dinner service Napoleon gave his sister, Elisa Baciocchi, Grand Duchess of Tuscany. Adm Mar-Oct €16, €8 EU citizens ages 18-25. Under 18 free. Nov-Feb €10, reduced 5. Combined tickets with the Uffizi and the Boboli Gardens Mar-Oct €38, reduced €21; Nov-Feb €18, reduced €11. There's a 50% early bird discount on tickets purchased by 8.59am, with entrance by 9.25am. Museo delle Porcellane: €6. Nov-Feb 8.15am-4.30pm; Mar & Oct 8.15am-5.30pm; Apr, May, Sept & Oct 8.15am-6.30pm; June-Aug 8.15am-6.50pm. Closed first and last Mon of each month, year round. Adm €7, €3.50 EU citizens ages 18-25. Under 18 free. During special exhibitions, adm €10, reduced €5.